Don’t Forget To Sign Up For The Music PLN/Twitter Webinar On Monday! 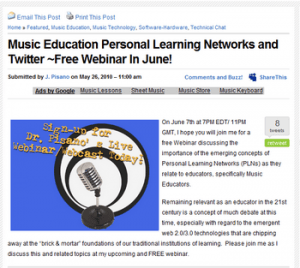 On June 7th at 7PM EDT/ 11PM GMT, I hope you will join me for a free Webinar discussing the importance of the emerging concepts of Personal Learning Networks (PLNs) as they relate to educators, specifically Music Educators. I’ve recently decided to give a sneak peak of the much anticipated new music site: The MUSIC PLN (http://musicpln.org /com) at this Webinar -Don’t miss it! This webinar is FREE and a great way for many of you to get a handle on the new concept of PLNs, Professional Development (PD) in the new digital world, and many othe r related concepts and ideas. I will also be discussing ways to get more out of the #MusEdChat every Monday night -which directly follows… If you’ve been a little shy about Twitter and the #MusEdChat -This webinar will be a great intro for you. Get ready and fasten your seat-belts, this seminar may prove to be “mind-blowing” for those of you still stuck in the technologies of the early 2000’s (Say…pre-2006). In addition, this is a great opportunity to build your own PLN or Global Learning Network (GLN) almost instantly with the tools and information that I will provide. In my humble opinion, YOU DON’T WANT TO MISS THIS! Please join me and participate in our on-going discussion about music, education, and technology! Soundtree is not only a pioneer in Music Technology, but a tremendous innovator of Music Educational Value through Technology. This year, SoundTree has started and is maintaining a great service to Musicians and Educators through their FREE “after school webinar” service. With it, they are inviting top-name people and top-of-the-field educators to discuss both innovative products and timely educational issues.